It’s understood the Ballyclare man and Northern Ireland U21 international, who was brought to Euro 2016 in France by Michael O’Neill to train alongside the first team, has signed a pre-contract agreement with the Windsor Park club for a three-year deal, beginning next season. 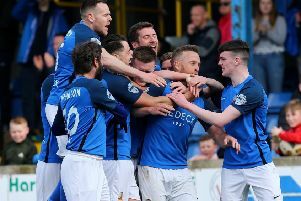 Having seemingly slipped down the pecking order in the title race this season and having taken a significant knock-back when losing out on transfer target, David McDaid to Larne earlier in the January transfer window, it appears those setbacks haven’t prevented Healy from clinching what would be a marquee signing. While the clouds of doubt hover over Windsor after a frustrating season thus far, this move sends out a message to rivals that the champions will be back to recapture their crown next year. It really is a quality signing for the struggling south Belfast men. Cooper is a class act and it’s only a matter of time before he secures a move across the water if he lives up to his potential under Healy. I’m sure it was a tough decision to depart Mourneview but he will be no doubt be delighted to be playing his club football at the National Stadium as surely it won’t be long before he makes the step up to the Northern Ireland senior side.